Nothing like the biggest business story in recent memory — JPMorgan buys Bear Stearns for $2 (a share) — breaking on a Sunday to bring into sharp relief the difference between news on the web and news in print — not to mention differences in how news is presented on the web. What’s so interesting about this case is that all the reporting on this story from Friday — when business news usually takes a break for the weekend — quickly became utterly old and outdated when the deal was announced on Sunday. As of Friday, it was clear that Bear Stearns was headed for a government bailout, but the fire sale price really took everyone by surprise. This deal was rushed to closing on Friday to try to prevent a market meltdown from beginning in Asia before the start of U.S. “banker’s hours” on Monday. So you’ve got the fifth largest investment bank sold for almost nothing and international markets opening with a scream — all on a Sunday evening. What’s a newspaper to do? Especially when this story will continue to unfold throughout the day on Monday. Printing the paper Sunday night must feel like shooting a movie with a still camera — you capture a moment in time, but the action is already moving on. In my first issue of the Washington Post Sunday edition today, the front page lead is a local story on D.C.’s gun ban, and the business section lead is an evergreen story about getting your own health insurance — nothing on the Bear Stearns story — and I say, well done. There is plenty of non-breaking news content in the paper that looks interesting to read later in the week, if I have time, and that’s the way it should be. I’m planning to read a piece on Eliot Spitzer by fiction writer Richard Russo — a reflection on the story after the news is done breaking does well in print. In contrast, the fast moving Bear Stearns story and its reverberations in the financial markets belongs on the web, a medium much better equipped to handle it. But there’s a lot for news organizations to learn about how this story is covered and presented on the web — and how a news consumer can follow it and find interesting coverage. They’ve clearly got the story covered, but the homepage has changed greatly throughout the day as the story broke — and there’s no way to look back. 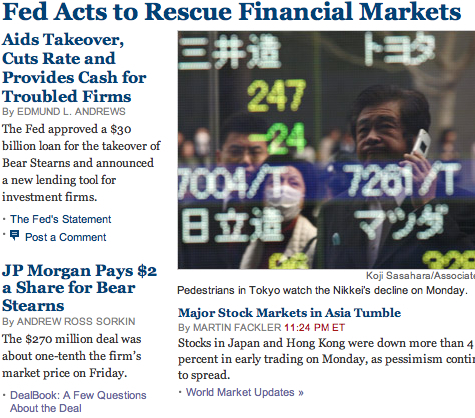 The homepage is still operating like a print newspaper, capturing a moment in time. Update: Bear Stearns has agreed to sell itself to JPMorgan Chase for $2 a share. The firm’s shares closed at $30 on Friday, giving it a market value of $4.1 billion. 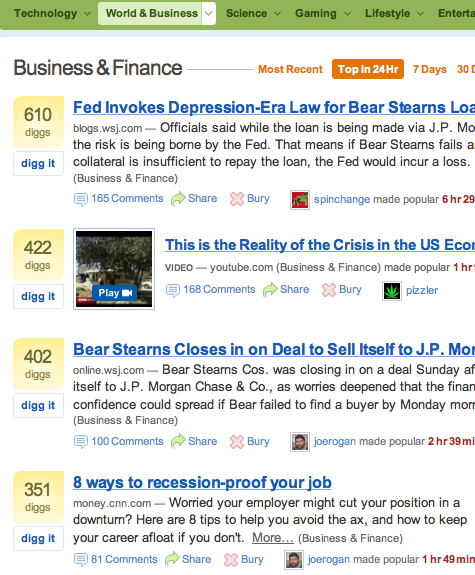 For DealBook’s full coverage of the Bear Stearns crisis, go here. For this story, DealBook’s blog format is much more useful — especially since they can update a post with new facts, but still leave it as part of the chronology. News is not static — it’s constantly in motion. But it also has a narrative, a story arc that it is often very instructive to follow. The New York Times has a wealth of reporting that covers a story as it unfolds — but the homepage is useless for looking at the story arc. NYT also segments its main news reporting, i.e. what goes in the print paper, from its web publications like DealBook, making it impossible to get a coherent view of all its content. I get NYT headlines on Twtitter, but I heard about the story from Howard Lindzon long before the NYT story hit my Twitter feed. When a story interests Digg users, it’s a lightning fast news source, but here, not so much. And did I really need Digg to tell me to check out WSJ or CNN? 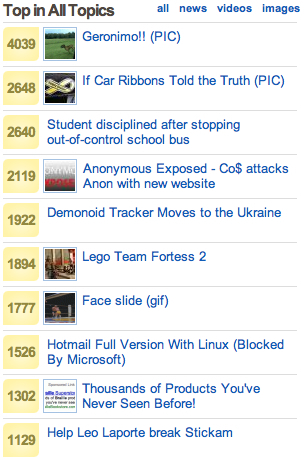 Also notice it’s just a few users submitting most of the stories. 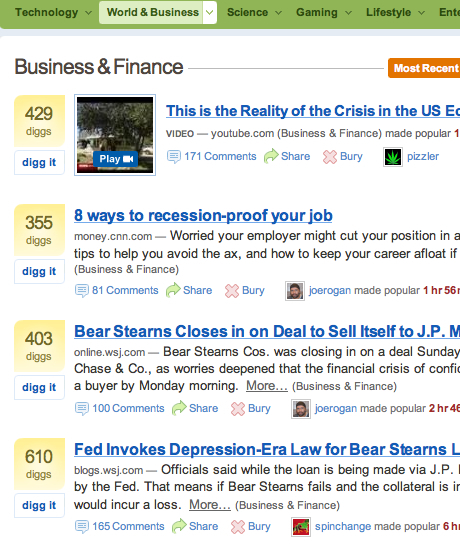 The problem with following the Bear Stearns story on the web is that traditional news brand sites are too conflicted between serving print readers and serving web readers, and many aggregators are too narrowly focused to do handle business and the economy. Just as with election news, there’s a huge untapped opportunity to help news consumers on the web find and follow the best coverage of a breaking business story. Of course, there’s always Google News — if you can figure out which of the 3,920 stories are worth reading.